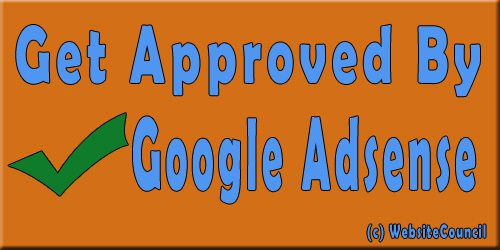 In this post I’ll share all the things that helped me to get my AdSense account approved by Google. If you are a blogger, you must have heard about Google AdSense. It is currently the best Pay-Per-Click Ad Network; you just have to place some HTML/JS codes on your blog and AdSense will do the rest. AdSense finds highest paying relevant ads for your blog automatically and displays them on your blog. AdSense has a lot of publishers that support Indian traffic and it pays good amount for Indian Clicks. But it’s a bit difficult to get approved by Google AdSense. Google AdSense doesn’t accept all type of websites and they have strict criteria that a site must meet to be approved by AdSense. AdSense doesn’t approve websites which are hosted on sub-domains or use free domains like .TK or .CF. Your site must be using a Top Level Domain or Country-Code Top Level Domain (.TK, .CF and other free ones are exceptions) to get approved by AdSense. Note: If you are using Weebly, Blogger or BlogSpot to create your blog and are using their subdomain for your site, you can still get a Hosted AdSense Account. I’ll soon create a tutorial on how to get a Hosted AdSense account soon. I have seen many people who get a .TK domain and a free blog at BlogSpot and blatantly copy articles from different site to publish them on their own blog. If you are one of them, I’m sorry to say, it’s IMPOSSIBLE to get genuinely approved account by AdSense with such sites. If you really want to be approved by AdSense, You should publish at least 15 to 20 High Quality articles (at least 500 words long recommended) on your blog. These articles must be unique, must provide some value to your readers and should not contain too many grammatical errors (You can use Microsoft Word to check your articles for errors before publishing them to your blog). Articles should be relevant to your blog’s niche; you should not publish SEO articles on a Sports related blog. AdSense does not approve sites that look spammy and a site that is completely filled with ads does look spammy. You are not required to remove each and every ad from your site, just remove a few of them so that they don’t affect the user experience. Your website should be easy to navigate. It does not matter how many articles you’ve posted if they are not accessible at all. Google recommends that your site’s navigation should be user friendly. You can interlink your articles with each other to make them easily accessible. Google AdSense doesn’t accept such sites which are under construction. Before applying for AdSense, make sure your site is fully completed. Sometimes Google AdSense thinks that a site is under construction if it has too many CSS and HTML errors. Before submitting your site to AdSense for approval, take your time and read their guidelines and policies. One last tip: Keep trying; if your AdSense application is declined, wait for a few days (do necessary changes on your site as suggested in the email sent by AdSense) and apply for AdSense again. I too did not get approved by AdSense in my first attempt; I was approved after submitting my fifth review request to them. 1. Is Google AdSense 6 Months Rule For Asian Countries Really Important? Google requires website submitted by Asian Publishers to be older than 6 Months for it to be approved. But, I have seen many Indian publishers who were approved by AdSense for websites which were just 1 or 2 months old and I have not heard any Indian blogger complaining that they were not approved due to their site’s age. If you’ve a good site, with enough content and traffic, Google AdSense will approve it even if the site is not 6 Months old. If you think your site deserves AdSense, you should submit Application to AdSense even if it’s not 6 Months old; it won’t hurt to try. 2. My Site Does Not Receive Much Traffic, Would My Site Be Approved By AdSense? Yes, AdSense approves a site even if it does not receive any visitors. But, I won’t recommend you to submit an AdSense application until your site receives at least 100 Unique Visitors every day. If your site does not receive enough visitors then you won’t earn anything with Adsense; what’s the use of an Approved AdSense Account if you can’t earn anything with it? Google AdSense has two step verification process. First step of verification is done by automated bots that check if your site has enough content, if you’ve a TLD or ccTLD, and if your GMail Account that you used to apply for Adsense with is eligible (if account holder’s age is 18 or older) or not. Getting approved in the first step is very easy. If your application is approved in first step, you’ll be given access to your AdSense Dashboard and will be asked to add AdSense Ad code on the website you had submitted with your Adsense application. Google asks you to put Ad code on the site to verify if you are the owner of the site. The Ad code will not show real Ads but blank spaces until your account is fully approved. The first step verification process generally takes 2-3 days before your application is approved or declined (sometimes it takes less than 5 hours). * Second Step Veficiation process only starts when you add AdSense ad code on your site. Second step verification is also done by bots. In step 2, Google verifies if your site’s content meet Webmaster Quality Guidelines and AdSense Policies. It generally takes 3-7 days before your application is either approved or declined. If your application is approved, the Ad codes you had added to your site for the review will automatically start showing AdSense Ads; if your application is declined, you’ll not be able to access the AdSense Dashboard that you had got after the first step approval. You Are Not Approved By AdSense Even If Your Site Complies With Their Policies? I don’t know why Google would not approve a website if it follows all of their guidelines and policies. Maybe, you think that your site complies with AdSense policies when it actually does not? If your application is declined by AdSense more than once, you should ask people at forums to review your site and see if it complies with AdSense policies; you can also post a link to your site using the comment box below and I’ll try to review your site myself. If no matter what you do, your AdSense Account is not approved then you should not just quit blogging because there are many alternative ways to make money with blogs; you can try other PPC Networks like AdBrite, Bidvertiser and Chitika or CPA Networks like Peerfly and AdUncle. If your blog receives huge traffic but is not approved by AdSense, you can also go for affiliate marketing. If you’ve any questions, feel free to ask them using the comment box below. This entry was posted in Make Money, Tutorials and tagged AdSense by admin. Bookmark the permalink. I had two accounts for Adsense, First was blocked saying something i did something wrong. Next one i used it for a while. But closed it as i was not using it much. Currently i run a website, i will make sure everything is followed as you posted and apply for Adsense and get back to you. If you were banned previously, according to Google AdSense policies, you can’t apply for a new AdSense account. There are some tricks to bypass this though. I know but i got through it some how. Do you think a forum has a good chance in getting accepted for the program? If the forum has good content and it complies with their policies, they should accept it (if it was not banned before). Check your forum thoroughly for the posts that don’t comply with AdSense policies and remove them.